February 13, 2019 10:32 AM EST / NAPLES, FL—Global Biomedical Technologies (GBT), an emerging MedTech company that has developed the world’s first switchable smart medical adhesive product platform, and Lewis Drug, the 56 store neighborhood pharmacy spanning across South Dakota, Iowa, and Minnesota, announced their partnership today to integrate the Comfort Release® platform into its pharmacy locations in February 2019. The affiliation between the two companies will provide Lewis Drug customers with a new portfolio of pain-free medical adhesive products for sensitive skin wound management, starting with acute care bandages and transparent tape, and will continue to expand the portfolio resource throughout the year to include advanced options such as foam and transparent dressings. The new platform integrates smoothly into the pharmacy’s current acute care offerings by expanding and simplifying the process of managing sensitive skin based wounds for seniors and children, which ultimately benefits both pharmacies, patients, and providers. “The addition of the Comfort Release® platform has really streamlined a continuum of care process of assisting patients with managing their wounds along with their sensitive skin needs. 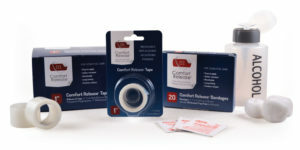 It has also been extremely helpful when trying to find a cost-effective alternative for certain medical bandages and tapes that are not completely pain-free at the time of removal,” said Troy Claussen, Category Manager at Lewis Drug. Lewis Drug and GBT both take pride in offering superior customer quality of care and the accessibility to new innovations that will help patients improve healing and ultimately save money. Key West, FL (December 7, 2018) Global Biomedical Technologies (GBT) has expanded its portfolio of research innovations beyond its first commercial product launch of Comfort Release® acute care/first aid wound bandages and tapes with a 2019 entry into the advanced wound care market space. GBT featured this novel adhesive technology along with acute and advanced product samples at the 5th Annual Innovations in Wound Healing meeting held at the Casa Marina Key West Hotel and Convention Center in Key West, FL, December 7, 2018. In addition to introducing currently available Comfort Release® acute care and first aid bandages and tapes at the meeting, GBT provided a preview of its entry into advanced wound care by sharing samples of its new portfolio of foam border and transparent adhesive dressings, and IV catheter and tubing securement dressings within its exhibit hall booth. The new portfolio is scheduled to launch in the US during the first quarter of 2019. GBT also featured a clinical poster presentation at the meeting titled, “The Benefits of Oligomeric Switch Adhesives in Advancing Wound Care” as the breakthrough Peel Strength and MVTR data will support both the acute and advanced wound product portfolios. A recent article published in Wound Source by Laurie Swezey, RN, CWOCN titled, “How to Decrease Pain Associated with Wound Dressing Changes,” demonstrates the potential for the Comfort Release® Smart Switchable Pain – Free adhesive technology as the number one remedy cited is to choose the correct dressing that won’t adhere to the wound bed and can be easily removed. Global Biomedical Technologies is based in Naples, FL and is a commercial consortium comprised of leading academic medical researchers, and governed by a board of directors who are leading experts in adhesive innovations, patient care, and downstream market strategy. For more information, visit www.comfortrelease.com. Comfort Release® is a product developed by Global Biomedical Technologies to transform the medical bandage industry in the way wounds are treated now and into the future. And it’s not just the medical community that is giving this new product rave reviews. In test trials, moms overwhelmingly preferred affordable Comfort Release bandages because the bandages stay in place during normal bathing and physical activity, yet release gently when removed.